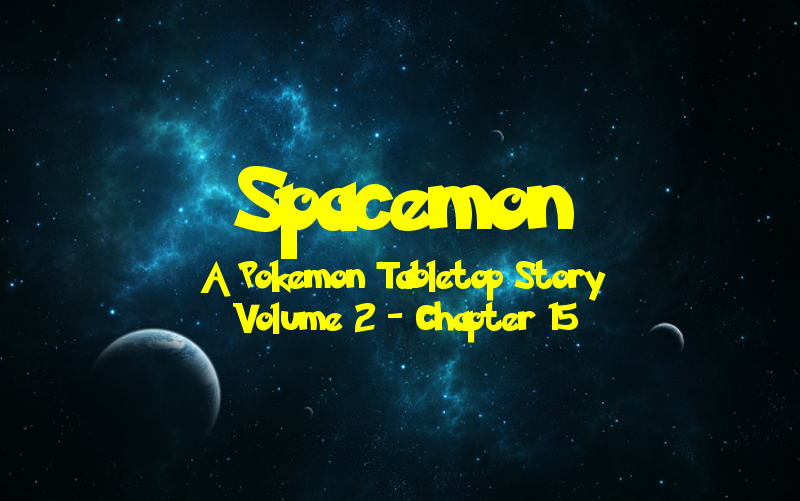 Welcome to another relaxing installment of Spacemon, the tale of a Pokemon TRPG campaign! It is a sci-fi space epic played using the Pokemon Tabletop United (PTU) system and GMed by fellow TAY author DragonStorm247. You can get caught up on our previous adventures here! The crew of the UAS Helix faced off with fighting type gym leader Jerome MacJabber! Battling their way through the tournament-style Fighting Gym one round at a time, the crew made tons of money winning fights and betting on matches until they reached the gym leader! The exciting battle ended in a one-on-one showdown between Alex’s Lampent and MacJabber’s Blaziken which resulted in a double knockout! In the end, the victory was given to Team Helix and they earned the Belt Badge! After their exciting victory in the Fighting Gym, the crew returns to the Helix for some much needed rest and relaxation. But soon it’s back to business and the crew meets up on the bridge to plan their next move. “We can be Space Ninjas and sneak aboard!” Alex blurts out, but no one takes her seriously. “I don’t think that’s quite how it works,” Morgan tells him. “Yes, but I’m not sure the rest of the universe will think that as well,” Shane points out. “Going to this conference is very important,” Morgan tells him. “And the only people who can get into the conference are those who are deemed important by most people,” Shane adds. “You don’t make any sense,” Alex retorts. “Yeah, the Admiral?” Shane asks. “But the issue is contacting her,” Shane points out as he tries looking up the FNS Halberd, Graves’s ship, and finds nothing. “She’s on a military vessel so it’s not like we can just look up where it is or how to contact it. So, anyone got another idea? “What if we, like, hack the Federation and steal some invitations?” Alex suggests. “What if we could get a politician to get us in?” Dmitri suggests. “Sure thing, boss,” the pilot responds. She begins firing up the engines in preparation for departing from Siogern VI. Alex stares at H in confusion, not really understanding anything she just heard. She look over to Shane and sees a confused expression on his face as well. “What?” she asks. “Different how?” Alex asks her. “Simply put, I’m kind of a glitch in reality. I don’t even know how I exist,” Shane explains. He walks up to the bridge computer and touches one of its ports. Shane vanishes, only to appear on the viewscreen. He waves at Alex as she stares in awe. “You can go… inside a computer?” Alex asks. “Oh my God, that’s so cool!” Alex squeals in excitement. Things aboard the Helix settle down as the ship departs from Siogern, the crimson gas giant fading from view. Dmitri walks alone down the corridor on his way back to his room. He feels as if he’s being followed. By what, he is not sure. He turns but there is nothing behind him. He tries to shrug it off as he continues on to his room, but he can’t shake the feeling that he’s being followed. On the other end of the ship, Morgan approaches Shane’s warp lab. The vision she saw in the Warp the other day has been gnawing at her in the back of her mind and she needs to talk to someone about it. “Morgan, you okay?” Shane asks when he sees Morgan enter the room with a perturbed look on her face. “Can you turn that off for a sec?” Morgan asks him, eyeing the active warp drive in the center of the room. “Yea, sure,” he tells her as he shuts off the drive. “Did you, um, see anything?” Morgan asks nervously. “I’m not sure what to make of that,” Shane tells her. “Honestly, I’m not even sure if I even understand what Gilgamesh is talking about half the time. Like I said, it’s probably not important anyway. Sorry to bother you.” She turns and leaves the room. It’s a lie and she knows it, but she wants it to be true. Shane isn’t buying that one bit, but doesn’t feel like telling Morgan that is the right call. He turns to try to get back to work, but the thought of the Gardener begins to gnaw at him and he is unable to focus. When the Helix arrives back on Parisia, the crew splits up to take care of business. Armstrong provides H with a shopping list of equipment they will need to begin work on their experiments, as well as a bottle of 3488 vintage wine for when they complete the procedure, and sends him off to get them. Shane, Dmitri, and Alex go off to browse for TMs and other gear while Morgan goes to meet with Councilor Sophia Fontaine, her representative in the Genevan parliament. “Hi, I’d like to speak with Ms. Fontaine, please,” Morgan asks the receptionist when she arrives at Sophia Fontaine’s office. “Do you ‘ave an appointment?” he curtly asks her in his thick French accent. He silently hands her a form to fill out with her information, just to verify her citizenship, and that she is one of Councilor Fontaine’s constituents. “What is the nature of zis appointment?” he asks when Morgan returns the form. “Well, I was hoping to obtain invitations to the Galactic Governance Conference,” Morgan tells him. Morgan walks into the office and sees the councilor sitting at her desk. She looks up at Morgan when she sees her enter and puts on a fake politician’s smile. “‘Ello, ‘ow can I ‘elp you?” she asks. The following morning, Armstrong and H begin preparations to begin the procedure to transform H into the next-generation cyborg Armstrong had envisioned. The final components they need are delivered to the Helix and they put everything together. Once the preparations are complete, Armstrong straps H in and begins the first round of nanobot injections. Over the next several hours, the injected nanobots introduce mechanical additions to his DNA and organelles, cell by cell. Soon, his cells start autonomously producing all sorts of nanites, and his tissues become metallically charged. H awakens as Sunday night rolls around. With the procedure complete, Armstrong calls the rest of the crew to the lab. They gather to see H start to come around. His eyes open to reveal they now glow bright green. As his heart hums, pulses of green energy flow down his veins. His augmentations are visibly more integrated into his body; a perfect symbiosis of man and machine. That night, as Dmitri tries to sleep, he finds himself tormented by nightmares. He tosses and turns, mumbling in his sleep as the same person who he felt following him pursues him in his dreams. He awakens in a state of sleep paralysis, aware of his surroundings but unable to move. Something is in the room with him. He can see a figure shrouded in darkness lurking in the corner. His heart begins to race as it creeps closer. Dmitri reaches out with his mind and touches something very dark. He immediately recoils into himself, wishing he hadn’t done that. The figure moves closer still, now standing over Dmitri’s bed, still surrounded by darkness. His heart is pounding in his chest now and he whimpers in fear as the figure reaches out to him. Suddenly Morgan enters the room, the light from the hall illuminating the dark room. Dmitri quickly sits up, finally waking from his paralysis, and sees Morgan standing in the doorway; the figure is gone. “Do you always talk in your sleep?” Morgan asks, sounding quite annoyed. “How would I know; I’m asleep?” Dmitri asks her between ragged breaths, his heart still racing. Morgan leaves the room and the door shuts behind her, the light fading from the room. Dmitri releases Wilhelm and has the Haunter keep an eye on the room as he tries to go back to sleep. He hears someone faintly call out. And thus begins a long and restless night. “Why do I need to put these on?” he asks, clearly not happy with the idea. “H put on some pants!” Shane shouts into the room as he walks past. “You’ve never even worn pants,” Morgan points out. “Well,” H sighs. “I shall convince them otherwise… but some things must be done for progress.” He begrudgingly takes the pants and starts to put them on. After quite an ordeal, Morgan finally manages to get H to get fully dressed. H finds the clothes to be more comfortable than he would have expected, but the thought of dressing like this still makes him feel quite uncomfortable. “I’ll let you handle the public stupidity,” H replies. When they get inside, Morgan approaches the receptionist again. “Do you ‘ave an appointment?” he asks her. “Yes, I do,” Morgan replies. “Yes, I have,” Morgan replies. “This is Dmitri and Alex, and this is Subject H. As you can see, he has been outfitted with a number of augmentations including, most recently, a complete conversion of his somatic cells to a biomechanical hybrid.” The councilor looks on with interest as Morgan pulls out a Pokeball and releases her Pikachu. “This overcomes many of the common problems associated with advanced augmentation, most notably the complete elimination of augmentation shock.” Morgan nods and her Pikachu gives H a shock which does not affect him at all. “‘Ow much can ‘e withstand?” the councilor asks. “Much more than we were capable of producing in a lab setting,” Morgan informs her. “Really?” the councilor asks curiously. Morgan nods again and her Pikachu slams into H with Volt Tackle. H is knocked over but he quickly hops to his feet and brushes himself off, completely fine. “So tell me about ze rest of your team ‘ere,” the councilor tells Morgan as she eyes the others in the room. “What sort of sciences?” the councilor asks. “What other work ‘ave you done prior to zis project?” the councilor asks, approaching Dmitri. “Before this project, I was part of a small team that created an organic substance with unique properties. It is still being researched, but it has proven to be quite promising in its uses,” Dmitri tells her, referring to the warp goo he had created with H months earlier. Satisfied with these answers, Councilor Fontaine turns her attention to H. “What can you tell me about your subject here?” she asks Morgan. “Yes. I’ll admit that it was incredibly selfless of him to dedicate himself to this project,” Morgan tells her, holding back her contempt for H.
“So, tell me, ‘ow do you feel after ze experiments?” the councilor addresses H.
“So, what future applications do you see zis project ‘aving as it relates to galactic policy?” the councilor asks. “We’re trying to put it in the right hands,” Morgan adds. Session Notes: I think I speak for all the other players when I say this was probably the driest of all nineteen sessions of Spacemon that we’ve had. Part of that is on the GM (but it’s not entirely his fault since he was getting over a cold still) and partly on us, the players, for being too passive. No one did anything impulsive or crazy to spice things up in a session that mostly involved winging things. That said, there were a few interesting/important things that happened. Dmitri doesn’t seem to be doing too well after his encounter with the mirror. That’s what you get for touching it THREE FREAKING TIMES! I’m am very interested in seeing how this plays out. Then there’s H. He now has Volt Absorb and it’s worked in with such flavor! I’m really interested to see how H’s story continues to progress. And that leads me to the final thing. H is our ticket into the GGC! I am so excited to get to that mission. Espionage!